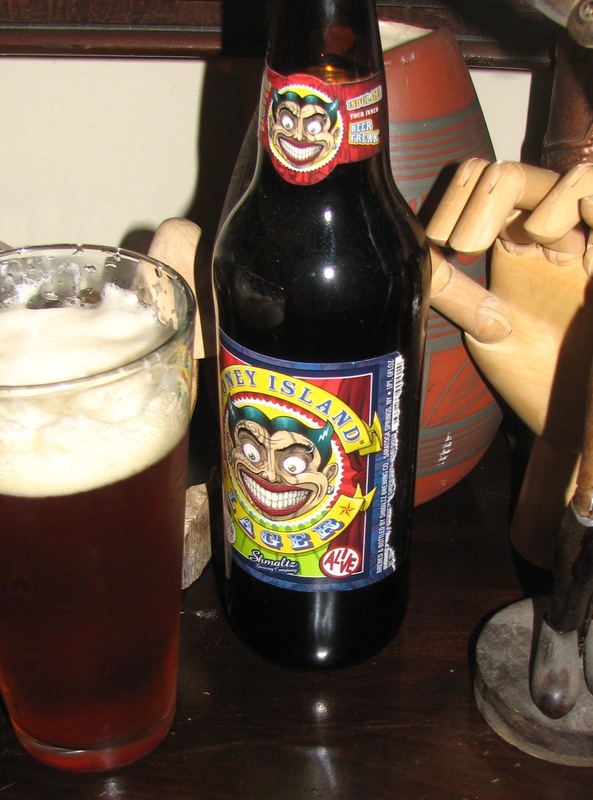 Revolution and Beer…of the week, Shmaltz brewing Co.’s Coney Island Lager, and this damned blog is whatever I say it is! No offense. All right, maybe that’s a little on the aggressive side, and I don’t mean to necessarily be that way, but we are talking New York beer, so I suppose a bit of attitude is appropriate. See, I could have gone any number of directions with this piece. I could rightly have talked up or down or anywhere else about Shmaltz Brewing Co.’s Coney Island Lager. But you and me, we’re tight as ticks, ain’t we? Ain’t we? I said, ain’t we! That’s better. See, this afternoon, and this is just between you and me, but I was feeling all philosophical and what not. I could have been using all these big collge-boy words, talking about 5.5%ABV, airy-cream-colored heads and this full bodied lacing. Maybe I was gonna tell you about Marris Otter and Red Wheat and light Munich 6L among the 8 Malts in this beer, or Warrior, Amarillo and Cascade hops. But we’re gumbahs, and you and me we don’t go for all that. Do we? Huh? That’s right. Speak up when I ask a question. Don’t be shy. I know. I know. You like the complex layering of Shmaltz beers. th ey just feel substantial with each taste, am I right? For the Coney Island lager, you liked that caramel fruitiness, that rich and full sweetness from that deep amber color that finished so nicely with a hoppy tickle at the back of the throat. You like that sweet aroma. don’t you? Go ahead, don’t mind me. Breathe it right in before you take a sip. I’m not judging you. Who am I to judge, right? Don’t answer that. I mean it. Seriously, don’t answer that. Here’s the thing, between you and me, and I don’t care who knows it, but just between us, I’m proud you had the guts to pick this one up. Shows some Chutzpah. You’re gonna need that to hang around mopes like me. By the w ay, never call me a mope, capiche? Yep, I’ll take a bit more of that. Just two fingers of that Shmaltz Brewing Co.’s Coney Island Lager- vertical not horizontal fingers. There it is! There’s that smile I like. And what’s that? What about the blog? Don’t take this the wrong way, but this damned blog is whatever I say it is! Now get going. No offense taken. You and me, were still like two peas, we’re like Velcro you and me, like dandruff and a black coat-inseparable. I’m getting all choked up here. Now beat it, and god love ya!